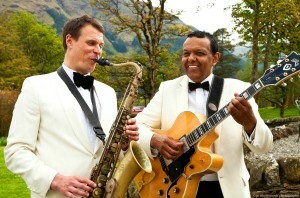 Why not consider using the Trio to play for your ceremony. The band has serenaded many brides down the aisle and the group’s guitarist is able to play appropriate solo pieces to add variety and change the mood during the signing of the register. If you are wanting a more traditional element to the ceremony, the Trio often use the services of a violinist or a flutist to play alongside the guitarist performing many of the often requested ceremony pieces such as Pachelbel Canon in D.
Following on from the ceremony, the drinks reception. Lively foot tapping continental style jazz, classic jazz swing and smooth Latin tunes played by the Trio at an appropriate volume all help to create a memorable experience. The guys are happy to perform outside (weather permitting) and will provide perfect music to keep the conversation flowing – guaranteed! Looking for something different to dance to? Then The Ritz five piece swing and dance band could be just the thing. All the musical ingredients to make your event truly remarkable, right from the very first note.